The city of Worms (pop. 86,000) has left an indelible mark on history twice. In 413, it became the capital of the first Burgundian kingdom, which destruction by the Huns 24 years later provided the source for the Nibelungenlied, one of the most famous epic poems in German mythology, transcribed by Wagner into a cycle of four operas. The second event was the Imperial Diet of Worms of 1521, in which Martin Luther famously refused to recant his religious beliefs, and was forced to flee and seek refuge at Wartburg Castle in Eisenach. The Nibelungenfestspiele Worms, a theatre festival centred around the Nibelungenlied, has been held every August since 2002. Founded by the Romans in 14 BCE on the site of an older Celtic fortress, Worms is one of the three oldest cities in Germany, a title it contests with Trier and Cologne. Known to the Romans by its Celtic name of Borbetomagus, Worms developed into a town with a Roman street plan in grid, a forum, and temples dedicated to Jupiter, Mars, Juno, and Minerva. It is on the site of the latter that the cathedral was later constructed. In 369, Emperor Valentinian I asked for the help fo the Burgundians, a Germanic tribe from the island of Bornholm in Denmark, to fight the Alemanni, another Germanic tribe, menacing the borders of the empire. In 406-408, under pressure from the east (notably the Huns), the Alans, Vandals, Suevi and Burgundians crossed the Rhine and settled in the Roman Empire. The Burgundians, under their king Gunther, established themselves in the Upper Rhine Valley, around modern Worms, Speyer, Karlsruhe and Strasbourg. In cooperation with Goar, king of the Alans, they set up Gallo-Roman senator Jovinus as a puppet emperor. Proclaimed emperor at Mainz in 411, he managed to keep his position in Gaul for two years. After that Emperor Honorius ceded the region to the Burgundians as part of a deal re-establishing Roman rule in Gaul. This effectively created the first Burgundian kingdom. Despite their new status of foederati, the Burgundians launched raids on the Roman province of Gallia Belgica. In 436, a Roman general, Aëtius, recruited Hunnic mercenaries in an attempt to crush the Burgundians. Gunther was killed along with most of his troops. The events became the subject of heroic legends that later formed the backbone of the 12th-century Nibelungenlied. Worms subsequently came back briefly under Roman dominion, fell in the hands of the Huns, then the Alemanni, before being eventually annexed to the Frankish kingdom in 502. Elevated to the rank of bishopric in 614, Worms became a county palatine under Charlemagne. In 1074, Worms was granted the status of free imperial city. In 1122, the Concordat of Worms, an agreement between Pope Calixtus II and Holy Roman Emperor Henry V, marked an important turn in the power struggle between the monarchs and the Church. Sovereigns were recognised the right to appoint bishops in the territories they governed, thus planting the seeds of nation-based sovereignty that would be reaffirmed in the Treaty of Westphalia (1648). In 1689, Worms was sacked the the troops of Louis XIV of France during the Nine Years' War. In 1743, the Treaty of Worms was signed, ending the Second Silesian war between Prussia and Austria. In 1792, the region was occupied by the French Revolutionaries. In 1801, the Bishopric of Worms was secularized by Napoleon. Following the Congress of Vienna (1815), Worms became part of the Grand Duchy of Hesse, and remained part of it until the dissolution of the Second Reich in 1918. 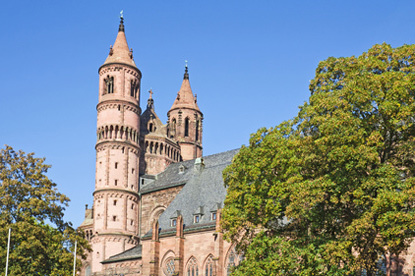 Worms Cathedral (Wormser Dom) is one of the finest examples of Romanesque architecture in Germany. Together with the nearby Romanesque cathedrals of Speyer and Mainz, it is one of the so-called Kaiserdome (Imperial Cathedrals). The cathedral was the seat of the Catholic Prince-Bishopric of Worms. Most of the cathedral was constructed in the 12th century, apart from the west choir and the vaulting that date from the 13th century, and the elaborate south portal that was added in the 14th century. The cathedral is 110 metres long, and 27 metres wide (or 36 metres with the transepts). The height is 26 metres under the nave, and 40 metres under the domes. Opened in 2001, this museum explores the fascinating world of of myths and legends of Siegfried the dragon-slayer and the Burgundian court through a series of entertaining multimedia exhibits. The museum is housed in two medieval towers part of the city wall near the Worms' old town hall. The museum is open from Tuesday to Sunday from 10:00 am to 5:00 pm (until 6:00 pm on Fridays). Admission is 5.5 € for adults and 3 € for children. Audio guide tours last 90 minutes. 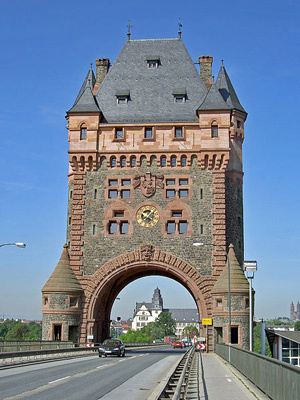 Worms is located along the Rhine, just halfway between Mainz and Heidelberg, approximately 45 km from either city. Worms is situated close to the interchange between the E31 motorway from Cologne and Koblenz, and the E50 from Saarbrücken and Metz. Coming from the south, take the E35 (from Basel, Strasbourg, Karlsruhe...) to Heidelberg, then drive around Mannheim following the signs for Worms. There are direct trains to Worms from Mainz (35min), Mannheim (20 to 30min) and Karlsruhe (1h10min). Trains from Cologne and Frankfurt require a change at Mainz, while those from Heidelberg and Stuttgart require a transfer at Mannheim.